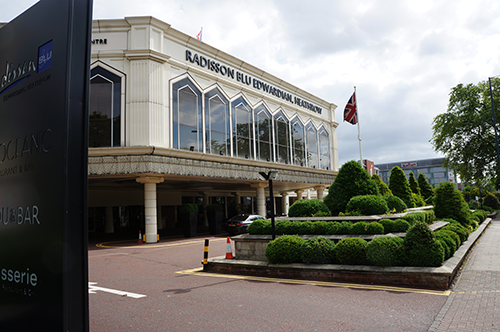 Minutes from London Heathrow International Airport, Radisson Blu Edwardian is a 4 star hotel which feels nothing like an airport hotel. Shuttle buses travel between the terminals and the hotel, making access quick and easy upon arrival at the airport. Trains to central London take only 15 minutes. BBSW delegates tell us the location is ideal! From junction 4 off the M4 follow signs to Terminal 1, 2 & 3. From Heathrow Terminals 1, 2 & 3 the transfer time to the Radisson Blu Edwardian Hotel is 14-24 minutes. There are several free local bus routes which stop close to the Radisson Blu Edwardian. Heathrow’s central bus station is located between Terminals 2 and 3, just a few minutes' walk from the Terminal buildings and it is well signposted. The bus station is open 24 hours a day and the travel centre is open from 06:00 to 22:30. Baggage trolleys are available and there is a lift to the underground level. Bus Numbers: 105, 111, 140, 285 – these all stop close to the Radisson. Buses typically go from Bus stop no.19 – but do check the bus before you board. You do not need a ticket – your journey is in the Heathrow Free travel zone. Arriving at Heathrow T4 - Use the free Heathrow trains to travel to Terminals 1, 2 or 3 and connect with a local bus as above. From Hatton Cross Underground Station - Bus Numbers: 285 or 423 (towards Heathrow) depart from outside the entrance/exit to the station. You do not need a ticket – your journey is in the Heathrow Free travel zone. Bus Stop for Radisson - Mondial Way. It is a minute walk to the hotel and you will need to cross the road at the pedestrian crossing. Alternatively, there is a Hotel Hoppa service (pictured) provided by National Express Coach service. Tickets are £4.50 each way if purchased in advance at: www.nationalexpress.com/hoppa or £5 if purchased from the drive. Take the Piccadilly Line to Hatton Cross (50 minutes from Piccadilly Circus). Plan your journey with London Underground's tube planner. There is a free bus services to connect you to the Radisson from Hatton Cross, please see the information above. The Heathrow Express is a fast-track train from London's Paddington Station to Terminal 1, 2, 3 & 4 and only takes approximately 15 minutes to get to/from central London. Trains depart every 15 minutes between 05.00 and 23.47. Take the Heathrow Express train to Terminals 1-3. 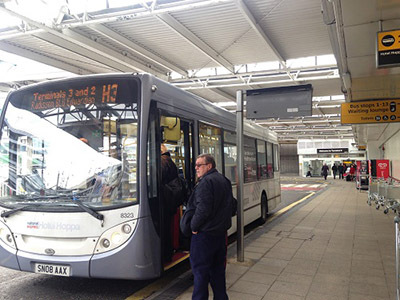 There is a free bus services to connect you to the Radisson from Heathrow Terminals 1, 2 & 3; please see the information above. If you need any additional information to help plan your journey, please contact Alicia Houghton at alicia@britishboarding.com.